As both a wholesome snack and a cultural symbol, dates play an important role in Emirati heritage. Date palms are one of few plants that can survive and flourish in an arid desert climate; they are also packed with nutrients and are a particularly good source of iron, calcium and potassium. The historical role of dates has been preserved in the present day culture; in keeping with the well-known tradition of hospitality, dates are always among the first things offered to newly arrived guests. Jars of deliciously sweet dates, accompanied by pots of steaming coffee, have become an iconic symbol of Arabic hospitality. The Date Festival, held every year, celebrates this symbol of Emirati history and offers all of us a chance to discover more about this wonderful and important treat. At the festival, local date palm growers and representatives from eighteen other nations proudly displayed their wares for potential customers and date-lovers alike to sample. As I wandered between the dozens of different booths, examining the rows upon rows of wicker baskets overflowing with dates, I was amazed at the sheer quantity of dates surrounding me. According to a pamphlet handed out to us at the entrance, more than five hundred different varieties were on offer. The combinations of sizes, shapes and colors that make up so many different varieties were almost unimaginable. 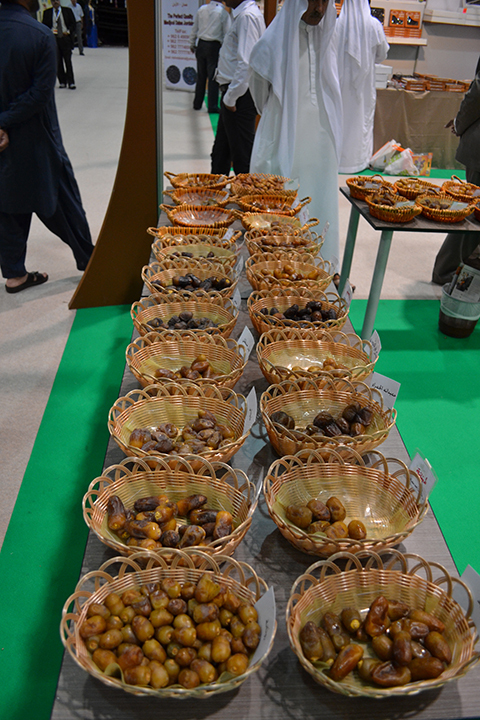 The different selections were not limited to just to whole dates; a myriad of date-derived products took center stage at many of the booths. Date paste to spread on biscuits. Syrupy date juice to sip from little cups. Dates stuffed with almonds, pistachios, and walnuts. Dates covered in chocolate, individually wrapped for a one-time treat or in massive gift boxes to share. Filled to the bursting point with dates? Can’t squeeze in another bite-sized sample? We found that there were many other ways to celebrate and enjoy dates that didn’t involve eating them. In one corner of the festival, customers had the chance to plant their own date palm tree. These trees, holding each planter’s name, were going to be replanted in the heart of Abu Dhabi’s downtown. A palm was on show at the center of the festival, with a climbing rope set up for those feeling brave enough to scale the tree. One booth even boosted a large date sculpture of ‘Malweat Samara’, the minaret of Iraq’s Grand Mosque.